This was a challenging read for a few different reasons. Jonah Murtag is a member of the Acolytes, a religious police force in New Bethlehem charged with eradicating heresy. When a string of suicide bombings take the city hostage, Jonah is charged with finding the culprits, beginning an investigation which leads to shocking results. 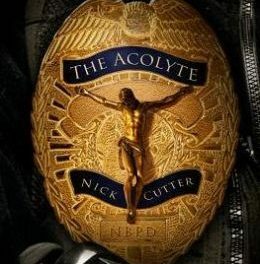 Nick Cutter has created a world in which the Christian far-right have finally gotten into power and are forcing the population to live according to their interpretation of the bible. Part of what makes this novel so effective is the fact that it is not hard to see such events in our future. It serves as a cautionary tale, alongside such books as 1984 and Fahrenheit 451. The world-building of New Bethlehem itself is nicely done but I did feel that the book would have benefited from some more detail about the rest of the world. 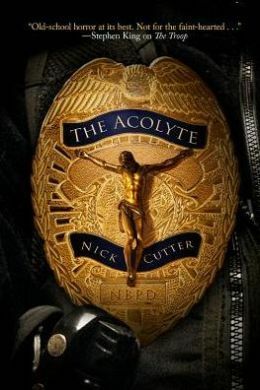 As is standard for Nick Cutter, this book has some gruesome scenes and it’s definitely not for the squeamish. There is one death scene near the end of the book that was particularly disturbing – to the extent that I couldn’t actually read it. When I realised what was about to happen, I skipped to the end of the chapter and picked up after the event. So The Acolyte comes with a content warning but it’s definitely worth a read.